Boulder has already experienced multiple large-scale disruptive events that have significantly impacted the community, including the 2010 Fourmile Canyon wildfire and major floods in 2013. During these events, even new facilities specifically built to support emergency operations required additional resources to function. In response, Boulder has begun to develop a program called “Creating District Scale Safe Havens to Support Community Resilience”. 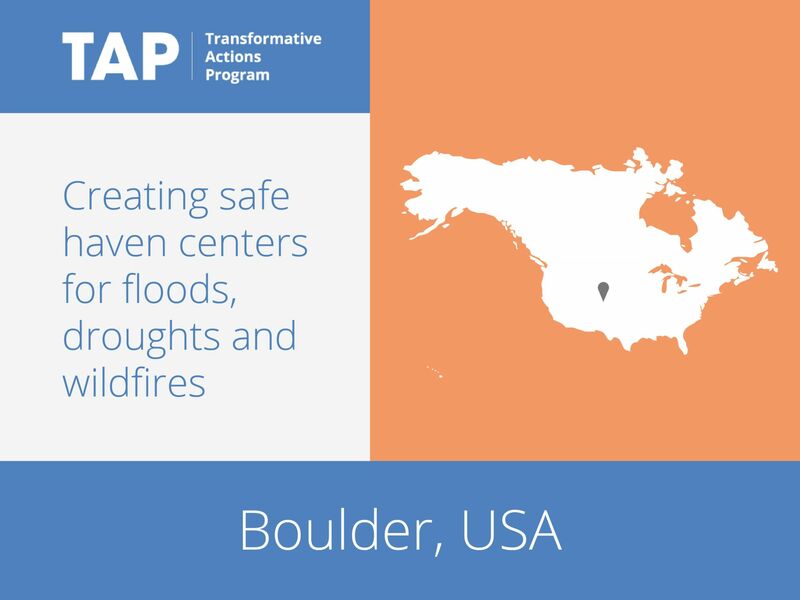 Safe Havens are self-sustaining and self-contained resilience centers that can operate during emergencies. In the long term, Boulder plans to develop a network of Safe Havens; in the short term, it is aiming to bring three pilot installations online by 2020. The proposed project includes planning for development of a network of island able resilience centers and it is anticipated that these resilience centers/safe havens will become an ongoing long-term (multi-decade) feature of community infrastructure investment and operations. This project will develop a replicable methodology and demonstration pilots that support continuity of critical community services, protection for high risk/high vulnerability populations and infrastructure, and an enhanced capacity to provide and maintain basic services at a neighborhood scale. Neither community safe havens generally nor those supported specifically by energy independent systems are particularly novel resilience concepts. However, recent events have highlighted the extreme vulnerabilities of core life-safety infrastructure and utility services – energy, water, and sanitation – and the interdependency of these systems to ensure secure, continuous operation during crisis. An important aspect in the design is the use of existing community facilities that are already in regular use by wide segments of the population and often have deep social value as rally points for safety and materials during a crisis. Integral to the approach is an extensive focus on neighborhood-based collaboration and involvement in site selection and development, in ways that integrate educational, social, and communications functions that build the social cohesion and collaboration essential to overall community resilience.